Amazon Fire Tablet Kids Edition may have one of the most unwieldy product names ever, AND a missing apostrophe, but it's still a great little device. It's long served up age-appropriate content for your kids, with a good balance of of the educational and the entertaining. Now, a pair of new upgrades lets you get a better insight into what your offspring are consuming on the 7-inch, Android-based device, and also talk to them about it, just like people used to do before kids had tablets. Available from just about… now, Parent Dashboard shows you what books, videos, apps, games, and websites junior has been perusing. It's a mobile-optimised, browser-based back-end to Fire for Kids, basically. So for instance, the conversation could go, "How many times do I have to tell you to read about how maths is fun BEFORE moving on to Space Boy and the Vampires from Planet Mongo?" Perhaps more practically, Fire for Kids also lets you specifically set how long kids must spend reading all the educational stuff they barely tolerate, before moving on to the enjoyable stuff. The other new arrival – oh, isn't he CUTE?! – is Discussion Cards. Also found on the Parent Dashboard, this gives you a real insight into what Shaniqua and Heracles are hoovering up from Amazon's knowledge shop. The Cards feature plot summaries for an impressively huge proportion of the available books on Fire for Kids, as well as many of the videos, apps, and games. They also, as the name suggests, feature suggested discussion topics. On David Walliams' hugely popular Billionaire Boy, for instance, once you've familiarised yourself with the plot basics, you may decide to ask questions such as, “What sort of person is Joe?" and "What is different about Mr Spud's brand of toilet paper?" Ideas such as 'come up with some fun ideas for new inventions, just like Mr Spud’s toilet tissue in the book,' are also provided. Now, while we're well aware that most hard-pressed parents' initial reaction to this will be, "Oh god, no…" we have to give props to Amazon for the amount of effort it's put into this, and how well the dashboard works. Who knows, this could really spark a new era of polysyllabic and engaged communication with your kids. It'll certainly give some insights into their development and preferences. 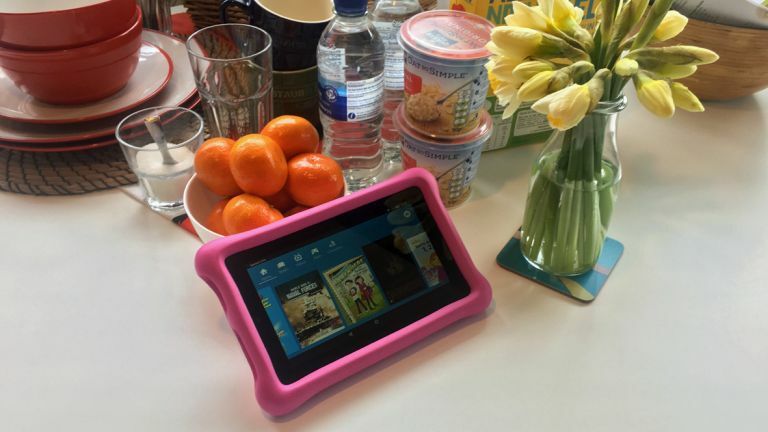 Anyway, at £80 and with a no-questions-asked, two-year warranty (yes, even if they've stamped on it, set it on fire or thrown it in the local duck pond), Amazon Fire Tablet Kids Edition is a great little device.